That nothing short of the takeover will save the airline, East Africa's oldest, from total collapse. Not even his well-known turnaround credentials. Mr Mikosz, who spoke amid rising opposition to Kenya Airways' takeover of JKIA's operations, said if nothing changes, the carrier will, in a span of five years, diminish to the level of its low cost subsidiary Jambojet and lose its prestigious tag of the Pride of Africa. "There is actually no way KQ can be profitable in its current state. I don't know how to do that," Mr Mikosz said. KQ's takeover of JKIA has been proposed under Project Simba, a turnaround blueprint that seeks to save it from collapse and anchor the country's aviation industry as a key pillar of the economy through continued investment in key infrastructure. He did not spare the airline's pilots whom he accused of stalling the recovery with their demands for hefty pay. "The pilots are overpaid and the workforce bloated, bleeding the airline to death," he said even as he criticised the government's failure to protect the carrier from unfair competition. KQ's minority shareholders also came under heavy criticism for demanding that the carrier pays a dividend when it is technically insolvent. "In neighbouring Ethiopia, the aviation industry has set a benchmark of delivering seven per cent impact on GDP," he said. He said the airline's slide from a profitable and leading airline in Africa to a dying carrier is attributable to the badly thought-out and executed Project Mawingu that did not take competition into consideration. "Problems were compounded in 2017 when the airline was forced into a bad restructuring programme that put taxpayers in a precarious situation, exposing them to paying creditors a staggering $750 million in case the airline went bust. Taxpayers have the obligation under the terms of a sovereign guarantee that the National Treasury offered the airline's creditors. "KQ's takeover of JKIA is one of the recovery options but if it does not go through the other option is to shrink KQ to Jambojet status, an option that means I will not renew my contract when it expires," said Mr Mikosz, who was appointed in June 2017. Last October, the liner submitted a privately-initiated investment proposal to the Kenya Airports Authority, the entity that runs all airports and airstrips in Kenya, seeking a 30-year concession to manage and develop JKIA under agreed terms--including payment of an annual concession fee. Mr Mikosz reckons that KQ's survival is tied to the proposed concession deal with the KAA. "All our competitors are subsidised and operate in a consolidated model with airports and a number of service companies," he said, adding that the perception created that KQ is merging with KAA is wrong because the deal is structured as a concession agreement in which the airline will only take over aviation-related assets in a long term lease while other JKIA properties, including land remain under KAA. Opposition to the deal has partly centred on what many see as a possible conflict of interest arising from its association with President Uhuru Kenyatta's family business. Kenya Airways owes Commercial Bank of Africa--which is majority owned by the Kenyatta family and has recently struck a merger deal with NIC Bank--more than Ksh4 billion ($40 million). 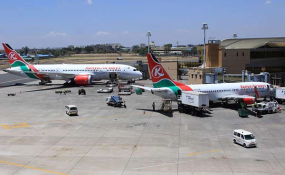 Some critics have dismissed the proposed takeover of JKIA as "a grand debt recovery plan" but Mr Mikosz insists that Project Simba, whose overriding theme is to open new revenue streams for KQ, is what is needed to reposition Kenya's premier airport as an aviation hub. Kenya has licensed 22 foreign carriers to fly into JKIA compared with five that are allowed into Ethiopia's Bole International Airport. "I am shocked when I see the government allowing more airlines to fly into JKIA," said Mr Mikosz, adding that the Ethiopian government has denied Kenya Airways a licence to any other part of the country outside Addis Ababa. Mr Mikosz says KQ taking over the management of JKIA should help revamp the airport's infrastructure and increase the traffic to 11 million passengers per year by 2022 and 30 million by 2049.